Tough times in the 1970s forced Woolworth UK to reconsider its 'no advertising' policy. For some time it had been placing advertisements in print. It finally had to embrace television, moving overnight from no presence to commercials that dominated the ITV schedule in the peak seasons. The campaigns delivered the first sustained increase in shopper numbers for many years, paying for themselves many times over. Some of the straplines and the parades of stars are still remembered, and frequently copied, to this day. 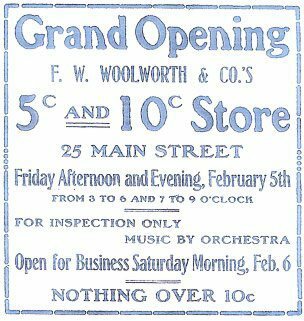 In the early days of Woolworth's only new store openings were advertised. The founder, Frank Winfield Woolworth, said "Dress your windows twice a week with big leaders with prices attached. That is our advertising". There were occasional exceptions, like the launch of own label cottons and sewing notions, and bullseye rings during the Great War. But these were rare. It was only in the 1950s that increased competition prompted regular advertising. A major press campaign in the USA generated good results. This was supplemented by 'The Woolworth Hour' on CBS Radio. Initially the idea was not adopted in the UK where sales and profit were booming. In 1959, with encouragement from New York, there was a wall-to-wall press campaign in Britain, along with the first tv commercials to promote the Golden Jubilee of the subsidiary. Afterwards the Board concluded that print had been most effective. They continued to use the medium throughout the Sixties. Then in November 1971 there was a new departure. A twenty page Christmas Catalogue was stapled into the Radio Times, which was the nation's largest circulation magazine. This showed the extensive range of toys, gifts and electrical appliances. Woolworth was the first company to distribute its catalogue to a wide audience in this way. As the idea developed, the best products could be ordered by mail using a new "Woolworth by Post" service. The firm went on to publish a Christmas Catalogue every Christmas until 2008, but dropped the mail order idea in 1982, restoring it for a spell from 1998-2001 and, as The Big Red Book, from 2006-2008. In 1976 another innovation brought money off coupons in the catalogues, which encouraged shoppers to buy early. The idea stimulated the sale of more than 100,000 electronic organs in 1976 and became regular feature over the following 32 years. The catalogues were a hit. They were soon copied by rivals like Boots the Chemist and W.H. Smith. Keen to stay ahead a more radical solution was implemented for Christmas 1975, as Woolworth's block-booked peak-time television advertising. The leading Ad Agency Allen, Brady and Marsh ('ABM') promised to repeat the success of its catchy 'This is the age of the train' campaign for British Rail (fronted by a DJ who can no longer be mentioned in polite society). The Agency excelled with a memorable campaign that added a new word to the Woolworth vocabulary that remained with the business more thirty years after the commercials last screened. Rod Allen wrote the jingle 'That's the wonder of Woolworth' and the tune 'The Wonder March', which was performed by the Winfield Brass. His business partner Peter Marsh filmed the action. He came up with the concept of the 'parade of stars', which continues to be used by a number of retailers in the twenty-first century. The commercials varied in length from 30 seconds to the whole ad break. They regularly featured a galaxy of stars. Georgie Fame and Sir Jimmy Young both did two or three minute slots to camera. Over the years there were lots of walk-on cameo appearances, from both stars and personalities in the news. See how many people you can recognise from walk of fame, which spans the years 1977 to 2007. Among the favourite TV campaigns of the era was Sir Harry Secombe's "Everybody Needs Woolworth" from 1979. It featured spoof pantomime sequences in which Harry (Aladdin) sang the names of as many products as possible in a commercial of up to three minutes' duration. At the end ("look behind you") a parcel fell from the sky and swallowed the rumbustuous former Goon. It finished with a muffled "it ain't half dark in here, where's my lamp?". Customers at the Worthing, West Sussex, Woolworth's, (which at the time had notoriously poor lighting,) had been asking "where's my lamp?" for years. One of them adapted the sign at the front of the store! Alongside the salvo on television, the banner print campaign continued. Some spreads featured specific products and promotions, while others concentrated on the brand. In 1980 investors and City analysts became the target. As part of the new corporate advertising Woolworth invested £100k to place a series of full page advertisements in the London Times and the Financial Times in 1981. The objective was to respond to City page criticism of what they considered to be lacklustre profit performance. The adverts sought to communicate the Board's strategy to revitalise the business. 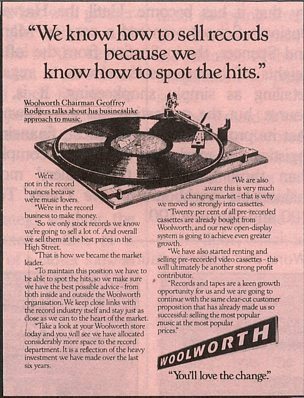 The copy highlighted the progress Woolworth had made in establishing large shares in its chosen new markets. It also flagged untapped potential which the Board was working to realise. Only months after the campaign ran, a potential bidder for the British subsidiary approached its US parent in secret. The campaign, which was intended to defend the British Woolworth from predators, had achieved exactly the opposite result!